When it comes to today’s topic, there was one person I knew would be able to help you out! Cassity and her husband have done some amazing (understatement) things to their home, and I’ve been following every detail! She definitely knows how to dive in head first with spectacular projects, so the girl knows what she’s talking about when it comes to “must have” tools. You might want to pay attention to this one! Chris, I am so excited to be here! Thanks for letting me come over and hang out with your readers today! 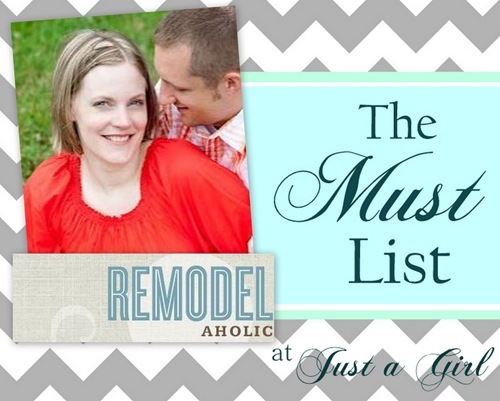 I’m Cassity from Remodelaholic, and you guessed it, I like to remodel (how’d you know). It is true. I am pretty much always scheming for bigger and better ideas for my house. But I would get nowhere without a few favorite hand tools, which is what I am here to share with you. 1. Safety First! 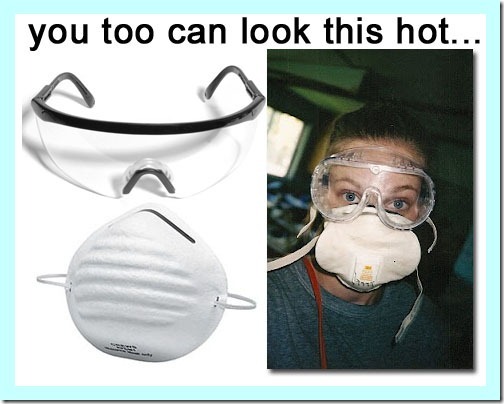 No matter what you are doing consider your safety first, you may not look very chic, but heck, I think we all look pretty hot in safety glasses…. 2. 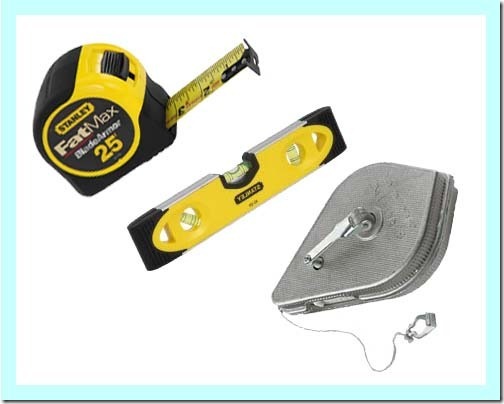 Getting Started A good measuring tape, levels, chalk line are absolute musts. All these little tools add up to a big hassle if you don’t get it right in the first place! Stanley Fatmax is the best and is really long lasting. Don’t go cheap on the tape measure. I cannot tell you how many we have purchased over the years because of cheap products. This one in particular can stretch about 11 feet without someone on the other end to hold it, a huge help when you are working on projects alone! 3. 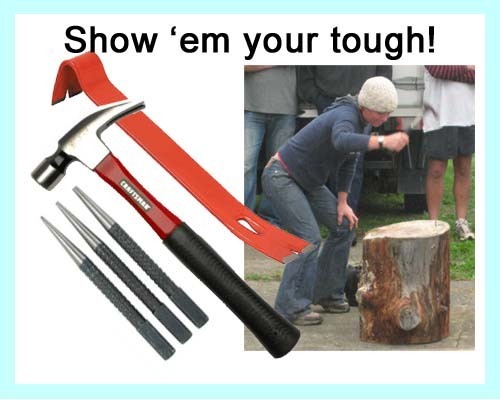 Some Demo / Building Tools Claw Hammer, Crow Bar and Nail Sets. No remodeler can go without the basic hammer it takes for demolition to decorating. This was our first and still is our most used tool. There are many options out there. Make sure that you get one with texture where it hits the nail to keep from slipping off. Crow bars are useful for cleaning up old wood and nail sets are necessary for any finished work! 4. Finishing up projects! 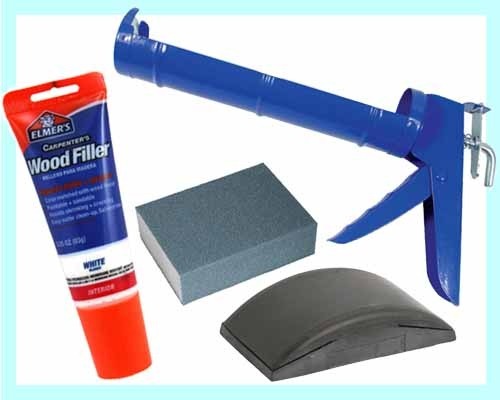 When working on projects there are a few final tools that you must have, sanding blocks, caulking gun, and a good filler! I love Elmers white filler, because it is water based and if the project is painted white it looks great with only one coat of paint! Dap paintable white caulk is my favorite. I have been using it for 10 years!!! 5. Painting Foam roller, angled brush, spray paint trigger and clean up tool! 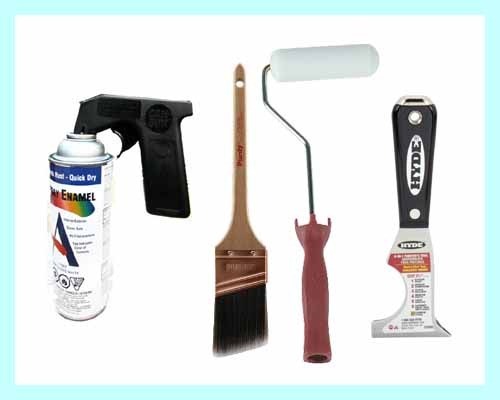 There are many things that we paint from walls to picture frames, make sure you have the right tool! For spray paint my must have is a trigger handle worth every single penny of it’s 4 dollar price tag! Don’t ever get a cramped index finger again! For rollers, if I need to keep the finish smooth nothing beats a white foam roller, this is great for furniture. Lastly a high quality angle paint brush, don’t go cheap… can I admit that I NEVER use painters tape. I just cut everything in by hand with a good paint brush! I hope this list is helpful! The best part by far for any DIY project is the feeling of accomplishment after! So jump in give it a try! Thanks again Chris for having me. And I hope you all will come and check out my blog Remodelaholic! Have a great weekend! Got my shopping list in hand! I want to look that hot too! Thanks for showing me how. Wondering what caulk/stuff when working around sinks/tile etc? Chris! Thanks again! I hope you are doing well. Sona- Around sinks people usually use silicone. (not paintable, usually clear and stinks to high heaven…) I am not sure why there is the difference, so I would just do a little searching round for when to use silicone vrs caulk!